Canada blatantly Photoshopped U.S. photos in order to slap a non-existent Canadian logo on the International Space Station, a blog post by the Economist revealed Friday. The photo in question depicts U.S. astronaut Stephen K. Robinson perched on the end of the Canadarm2 during a 2005 spacewalk on the International Space Station. The economic plan website isn’t the only place it appeared. It also showed up in a“Discover Canada” website, and even on the Space Agency’s Tumblr website. It is like placing the name of your tire on the car door.Dumb.dumb. For the amount of money it cost us we’d better make sure our name is fully visible. I have no problem with this. As a graphic designer for over 10 years I am appalled. This is just lazy photoshop work. A simple vector logo or png file would have done the trick. Agreed, who the hell cares? Theres ebola killing thousands, war in Russia/Ukraine, shootings parliament buildings, and some hack journalist is concerned over a photoshopped logo? A logo that was already on the arm in a different place? With a article title like “How Canada faked its place in space” how is that even an accurate title? It didn’t photoshop the Canadian flag on the moon. I think this article is more of a crime than its subject. Ebola exists. STOP REPORTING ON ANYTHING ELSE. It is cheesy, but I have to argue against Paul Delaney, it’s almost never called the Canadarm in the media outside of Canada. Time to march on Ottawa! Use Justine Bieber’s head for a battering ram! Grab all their beer, and return to ‘Merica. I agree, the photoshop is cheesy, but the photos are more true than the title of this article. 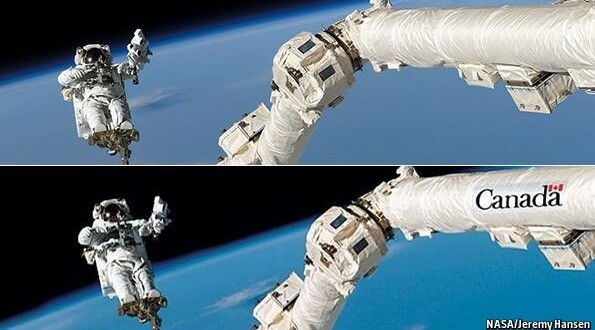 Canada did not fake its place in space as that is in fact the Canadarm. Someone just wanted to make the label more prominent because the real label is not if the frame. Bingo. Canada has commanded the station as well. This is nothing more than a promotional photo. If you’ve followed any of the space walks you can see the real logos. There are two arms on the station from Canada. Canadians are so insecure about themselves, just pathetic petty stupidity whoever did this. You mean like Americans were so insecure that Eisenhower had to get Diefenbaker into the middle of a lake to convince him to drop the AV ROE Arrow project in favour of a trade for concrete tipped Bomarc missiles? The same Arrow whose lead designer went on to work in the US to make the Arrow MK II otherwise known as the “American” Space Shurttle? The AV Roe Arrow with minor refits could deploy a satelite in space. The pathetic petty stupidity is anyone who thinks that the US is the only space faring nation. You can thank the Germans for the rockets, the Canadians for the shuttle/Canadarm, and the Russians for the space station. Without those groups, there would not even be a NASA. As for the Canada Journal, how about your staff learn some history first before you go spouting off about your country, eh? Eouuwww to my fellow citizens, parasites, and corrupt governments and industries……..